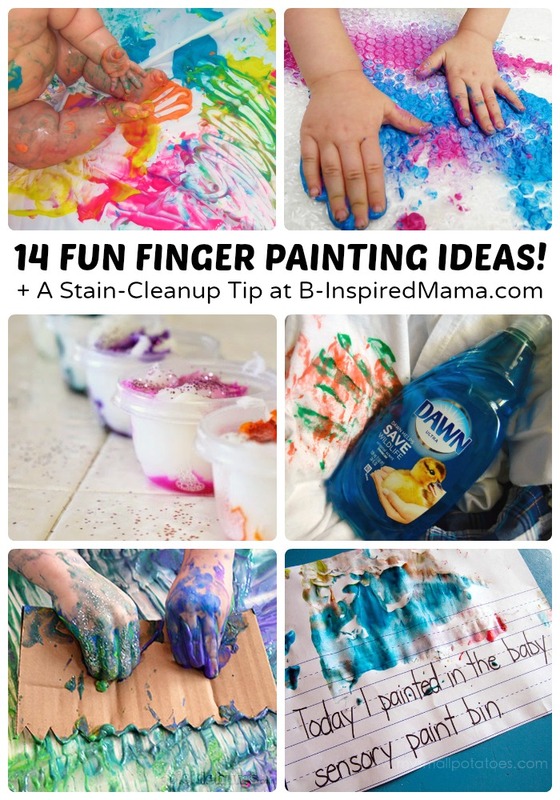 Do Your Little Ones Like Finger Painting? Make Homemade Finger Paint – Get the kids involved in the mixing and stirring when you make your own finger paint. Try this finger paint recipe from The Imagination Tree. Make It Scented – Use some drink mix to make your finger paint scented! Find out how at Learn Play Imagine. Make It YUMMY – Using pudding to make your homemade finger paint makes it safe, edible, and delicious. Find out how at Mess for Less. Try Some Tape Resist – Lay some tape down before painting to create easy tape-resist art. Check out these cool tape resist letters at Hands On As We Grow. Add Some Sparkle – Add a different texture and some visual appeal with some sparkles! Here is a homemade glitter finger paint recipe from Learn Play Imagine. Freeze It – Turn finger painting into simple science exploration (of temperature and states of matter) by freezing the finger paint first. Here’s how Mom to 2 Posh Lil’ Diva’s suggests doing it. Make It NEON – Check out how I Heart Arts n Crafts made their homemade finger paint in bright neon colors! Make a Print – The Imagination Tree shows how to do some simple printmaking while finger painting, too. And it’s even inspired by Van Gogh! Introduce Basic Color Theory – Give the kids finger painting in the primary colors (red, blue, and yellow) to allow them to experiment with color mixing and creating secondary colors (orange, green, and violet/purple). Paint on Bubble Wrap – Add an extra sensory element by inviting the kids to paint on bumpy bubble wrap. Check out the bubble wrap finger painting fun at Childhood101. Use Tools & Extras – Take finger painting to the next level by giving the kids some tools and extras to use. Picklebums shares some fun tools that you can find right around the house. Paint on a Mirror – Encourage the exploration of light and reflection by inviting the kids to paint on a mirror. Find finger paint and mirror inspiration at Mess for Less. Paint Between Wax Paper – Let the littles who resist the texture, paint between two sheets of wax paper instead. Head over to Teach Prechool to see how it’s done. Contain It In a Bin – Invite even the littlest to explore finger painting inside a sensory bin. Check out Small Potatoes’ Baby Sensory Paint Bin for inspiration! 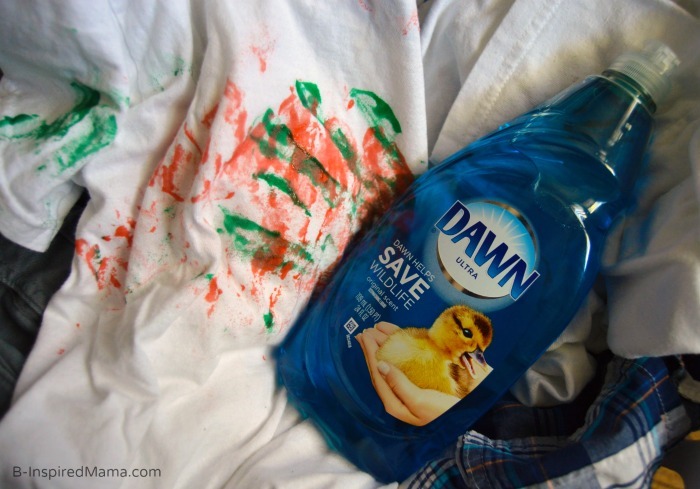 Apply Dawn directly to any cotton/polycotton fabric*, covering the entire stained area and rubbing it in with your fingers. 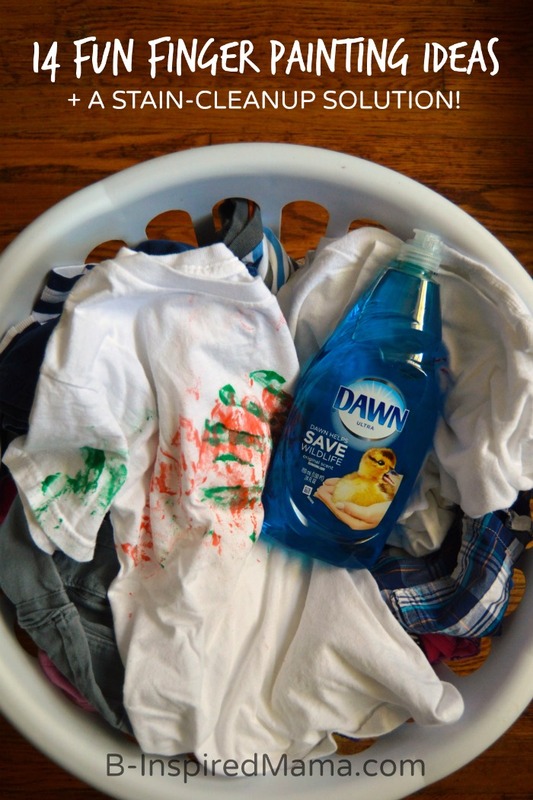 Wash the clothing as you normally would with Tide in your washing machine**. Do not reapply Dawn to the same spot and wash again. * For best results, use a little less than two teaspoons (9.5 mL) of Dawn in a top-loading washing machine – be sure not to use too much, and don’t use on delicate fabrics like silk. Spot test with a small drop in a less visible area to make sure the material will not be damaged. ** HE washing machines can be sensitive and cycle times may vary. Enter to WIN a Laundry Room Makeover! Looking for some more #DawnBeyondTheSink ideas and prizes, too?! Check out the Beyond the Sink Pinterest Promotion; Just enter here and then start pinning all of the ways you love to use Dawn around the house. You could win a $250 Target Gift Card or even the $700 Home Depot Gift Card Grand Prize! (The Pinterest Promotion ends on November 24th, 2014.) And if you’re on Twitter, too, make sure to join in the fun during the #DawnBeyondTheSink Twitter Party on Tuesday October 28th at 9pm EST. To participate, RSVP here and follow your hosts @DoubleDutyDivas, @BridgetteLA, @CeceliaMecca @AngieKcom @WhatMommiesNeed @RamblingChick, and our sponsor @Pampers. So tell me: are your kids mess makers like mine? Do they like finger painting? What are your tips and tricks for cleaning up the mess? This is a sponsored post written by me on behalf of Dawn. All opinions are authentic and my own. Please see my disclosure policy. Previous Post: « Mama Reads Monday – Pinterest Moms, Ministry, Adoption, and MORE! Thank you for the great ideas!! I love messy fun w my boys!! Oooh we love finger painting! Thanks for sharing so many great ideas and including ours!